What a fantastic weekend cooking in NYC for Danny Meyers 60th birthday at Blue Smoke BBQ on 27th street. 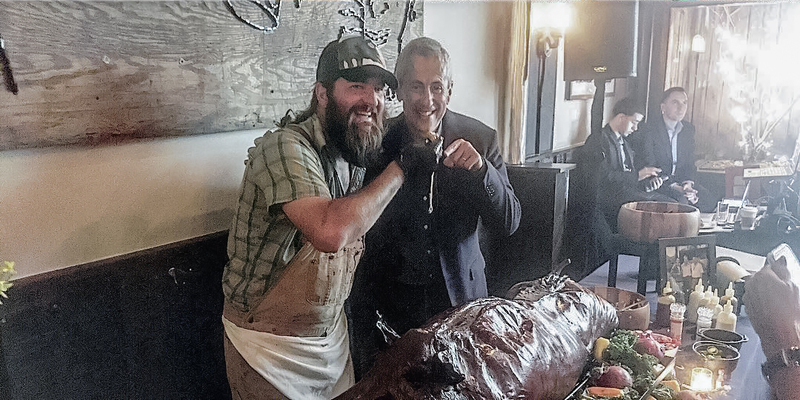 We were honored to be asked by famed Louisiana chef Jean Paul Bourgeios (Head chef for Blue Smoke Manhattan USHG) to cook2 of the worlds best hogs for his boss. We took Grover Cleveland a Sowega King (our farmers cross) and Sting an Ossabaw Island pig. We smoked the pigs for 25 hours at 200 degrees. They came out bangin!! We stuffed the cavity of the pigs with Tanks # 1 ghost pepper cheese sausage. Delicious heat at its best!!! The highlight of the night was feeding Danny Meyer belly spaghetti! We also made pig drops at Circa brewing and Putnams Irish Pub with Brooklyn’s best Southern trainer chef Shawn Burnette. Chef Radar as he is known in the culinary world was a sous chef at the famed Husk Charleston and Sean Brock’s famed restaurant, McCradys. 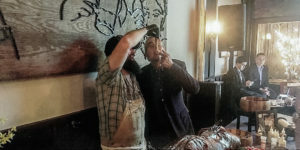 Chef Radar sources Ossabaw Island Pigs for his charcuterie program at both spots. The months pig, Summer Breeze will be hanging around in his curing chamber to create Carolina Iberico prosciutto, lomo, lardo, coppa, and Sausages. Look for our Pork in NYC at Blue Smoke with Chef Jean Paul or in Brooklyn at Circa brewing or Putnams pub with Chef Radar!